This is a a really clean 1961 Gibson ES 125 TC. It is a very dark cherry sunburst that has not faded over the years. This guitar was most likely stored in its case most of its life which accounts for the nice color and the overall condition. It is 1961 (serial 235XX) so it does have the wider, 1 11/16" neck. All original tuners, frets, pick-up, pick guard, bridge, knobs, tailpiece, strap button and finish. The neck is straight and it plays perfectly set up with light gauge 10-46 strings. This is the nicest ES 125 I have seen in a long time and it has the great color. Near mint condition with no evidence of playing wear. It come with the original soft case in excellent condition with all latches working as they should. 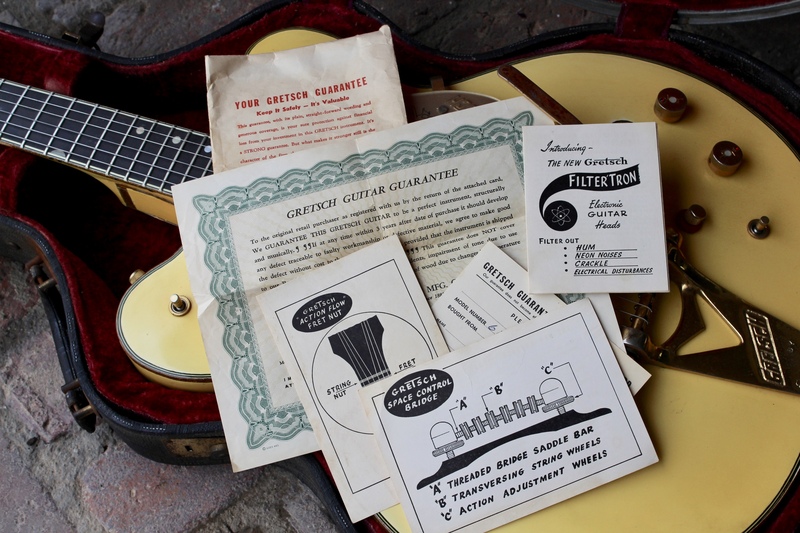 A cool vintage Gibson in hard to find condition. I accept Visa, MC, Amex and cashiers and personal checks and Paypal. I ship within 48 hours of payment, generally UPS or Fedex. I will take returns minus shipping costs both ways with 3 days notice after delivery.